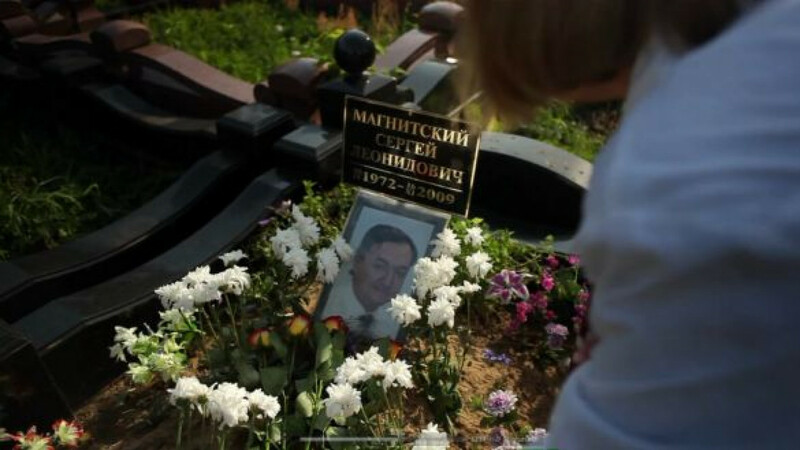 A screenshot from "Justice for Sergei," a documentary about the anti-corruption lawyer who died in pretrial detention in 2009. The mother of Sergei Magnitsky, the anti-corruption lawyer who died in pretrial detention in 2009, has filed a complaint in the European Court of Human Rights. The lawsuit, filed on behalf of Natalya Magnitskaya by the Open Society Justice Initiative, a George Soros-founded human rights group, accuses Russian law enforcement agencies of manipulating the criminal justice system to silence her son after he exposed a $230 million tax fraud involving Interior Ministry officials. "Sergei Magnitsky was wrongly detained and tortured because he unearthed evidence of grand theft at senior levels of the Russian government, then refused to back down," said James Goldston, executive director of the Open Society Justice Initiative and the lead lawyer on the case. "Though Mr. Magnitsky's courage was unusual, his fate is not. His case shines a spotlight on the corruption and abuse which pervade Russia's justice system," he said in an e-mailed statement. The complaint, filed Wednesday, says Magnitsky's death was the result of deliberate abuse while he was moved between five Moscow detention centers over the course of a year. It says he was persistently denied medical treatment for a life-threatening illness and was beaten by guards just before he died. The Kremlin human rights council uncovered the beating in a nonbinding report released last year. No one has been punished in connection with the death, although a prison doctor is currently on trial in Moscow on charges of negligence. The Magnitsky complaint asks the Strasbourg-based court to rule that Russia has violated six articles of the European Convention on Human Rights, including denial of right to life, torture, unlawful detention, retaliation against whistle-blowers and failure to provide an effective remedy. It was unclear when the court might hear the case. In a separate development, British lawmakers have urged their government to disclose the names of Russians banned from entry into their country in connection with Magnitsky's death. Britain earlier acknowledged that it had banned an unspecified number of Russian officials. "The government does not routinely publicize the identity of individuals denied a visa to enter the U.K., and it has resisted calls to make public any denial of visas to enter the U.K. for those who held responsibility in the chain of events which led to the death of Mr. Sergei Magnitsky," the House of Commons' Foreign Affairs Committee said in a report released Wednesday. "However, we believe that, when used sparingly, publicizing the names of those denied entry on human rights grounds could be a valuable tool in drawing attention to the U.K.'s determination to uphold high standards of human rights, and we recommend that the government make use of it," it said. The British call was praised by Magnitsky's former employer, Hermitage Capital, once Russia's largest foreign investment fund. "The Russian officials who tortured and killed Magnitsky are hiding behind a cloak of impunity and secrecy," a Hermitage spokesman said in an e-mailed statement. "Making the visa ban list public is the first step towards accountability for their actions, and we are pleased to see the recommendations of the U.K. parliament's Foreign Affairs Committee calling on the British government to do this." It's doubtful, however, that the government will make the sensitive list public. The U.S. State Department also has a classified list of Russian officials banned in the Magnitsky case, and U.S. lawmakers have drafted legislation to ban any Russian official accused of human rights abuses. The U.S. measures have kindled the fury of the Kremlin, which has accused the U.S. of trying to meddle in Russia's internal affairs and threatened retribution.